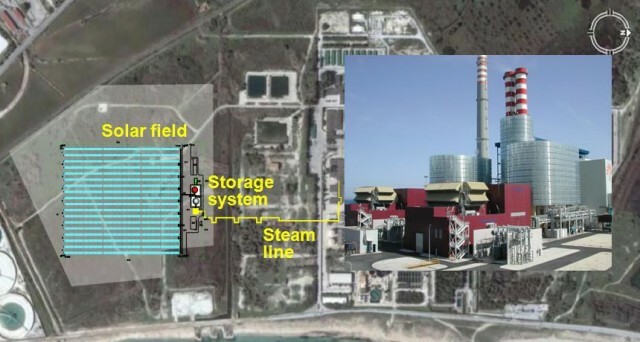 On 14 July 2010 the Italian utility Enel unveiled “Archimede”, the first Concentrating Solar Power (CSP) plant in the World to use molten salts for heat transfer and storage, and the first to be fully integrated to an existing combined-cycle power plant. Archimede is a 5 MW plant located in Priolo Gargallo (Sicily), within Europe’s largest petrochemical district. The breakthrough project was co-developed by Enel, one of World’s largest utilities, and ENEA, the Italian National Agency for New Technologies, Energy and Sustainable Economic Development. Several CSP plants already operate around the World, mainly in the US and Spain. They use synthetic oils to capture the Sun’s energy in the form of heat, by using mirrors that beam sunlight onto a pipe where pressurised oil heats up to around 390°C. A heat exchanger is then used to boil water and run a conventional steam turbine cycle. 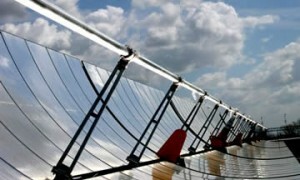 Older CSP plants can only operate at daytime – when direct sunlight is available -, an issue that has been dealt with in recent years by introducing heat storage, in the form of molten salts. Newer CSP plants, as the many under construction in Spain, use molten salts storage to extend the plants’ daily operating hours. Archimede is the first plant in the World to use molten salts not just to store heat but also to collect it from the Sun in the first place. This entry was posted in Clean Energy, Power Storage. Bookmark the permalink. Several websites quoted or referenced my article through other websites… it’s now countless! Obviously, this can be scaled down or up according to needs, as much as the technical data can be changed. Some clients might want more storage to achieve a higher load factor, some might prefer a lower storage capacity, and just modulate the plant according to peak prices (which tend to be matched quite well by nature in this case). Just give my name and link my blog in the credits. I’m on twitter as @o_en_blog. The projected costs in your comments (4,5 €cents/kWh, ~$0.06/kWh) – that’s based on a site in Egypt which I assume would benefit from more sunlight and cheaper labor than a comparable site in the US Southwest. We’re watching the price of PV solar rapidly drop. I would imagine that you are aware of First Solar’s recent announcement that they have brought their manufacturing costs down to $0.76/watt and expect to go lower soon. PV solar, since it can be distributed close to point of use has big advantages over other ways to generate power. It seems to me that CSP w/storage is ideal for late afternoon/evening peak demand hours with lots of cheap wind power picking up at night. Based on your ‘six cents’ figure it looks to me that CSP w/storage is a cheaper fill-in than other forms of energy storage (CAES, for example). Sorry for my late reply. I believe Egypt’s annual sun radiation is very much comparable to that of the US southwest. I’m not sure how labour cost projections have been made by ENEA, but as far as I know even the American NREL projections anticipate such low costs for CSP within the next ten years. As to PV, that is surely to be happening faster, with its LCOE having dropped dramatically in the last couple of years. I myself am getting involved in the PV business, and hopefully I will be able to share some insight on a 100kW ground mounted project in Southern Italy pretty soon. I believe PV has a unique disruptive potential that will mark a new era within 2015, when it will become apparent even to uneducated people that this is a great deal. I will discuss this in future articles. On a utility scale, both PV and CSP (the latter at GW scale) are ideally suited to meet peak demand, either at noon (the italian typical peak) or indeed in late afternoons. Generally speaking, any renewable will benefit from energy storage, although I’d expect wind to be “stored” through pumped hydro power at nights. In Italy we have several GWs of pumped hydro, currently using French night-time nuclear power to replenish reservoirs. Here’s an interesting map from NREL: daily direct solar radiation in Arizona, on a kWh/(m2 day) basis. A level of 8 is about equivalent to 2900kWh/(m2 year). I will try and dig further. Carlo – Thanks for all the good stuff. When do you expect we will see good, hard numbers on CSP/w molten salts storage? Will it take constructing one or more additional plants or will it be possible to make a firm statement based on this first plant? It seems to me that if it can be shown that CSP w/storage can produce ‘anytime’ power for less than $0.10/kWh there will be little argument for building nuclear. Saving a nickle a kWh can outweigh the cost of HVDC lines. As always, economies of scale should help. It is also useful to stress that ENEA envisages two different types of plants, one for selling peak load power at premium prices (lower load factor), one for anytime use, as it’s this latter example. It would be interesting to see what $/kWh would be for power depending on hours of storage. You’re reporting ~2 1/2 cents for immediate (the sun is out) delivery and ~6 cents for stored power. I would guess the cost of power stored for only an hour would be quite a bit less than power stored for five days. The latter requiring much larger storage facilities, higher capital costs. Question: Does ENEA have a track record for reliable statements/projections? If so, how trustworthy would you say they are? Those 2 different plant examples only have a different target price due to their design features, it’s not intended to be a different set of costs depending on storage or not. I don’t know how those projections were calculated, but I’m rather confident that a national agency wouldn’t give projections based on thin air. I guess the key to this is how realistic is the timing and sizing of CSP’s roll out. If we install GWs in these ten years (highly likely) then we should see results in that direction. There are some many unknowns, and one of them is the state of oil demand and supply in the mid term; if we go into an Oil Crunch situation, probably all renewables will get a formidable boost. Thank you for your good work. I am curious, how do you prevent the salt from solidifying in the pipes at night or during extended periods of cloudy days?